Mrs. and Mr. Northern Cardinal perch together on a cheerful flowering branch. The birds face each other as they perch on the festive plant. This original cute bird design makes a unique gift idea for all bird lovers! You can customize this gift! Move the design around, change the background color or style, add text or images -- make it your own! 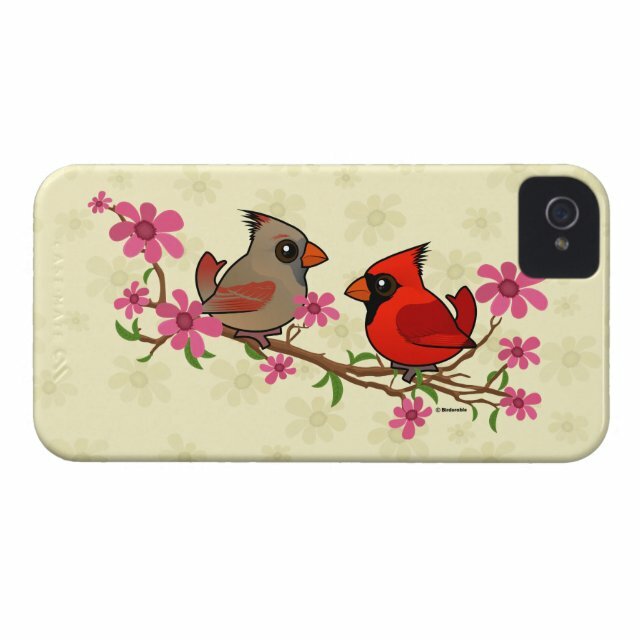 Protect your iPhone 4 with a customizable Barely There Case-Mate brand case from Zazzle. This form-fitting case covers the back and corners of your iPhone 4/4S with an impact resistant, flexible plastic shell, while still more... providing access to all ports and buttons. Designed for all iPhone 4s, this sleek and lightweight case is the perfect way to show off your custom style.